At Level 5, students demonstrate knowledge and understanding of the characteristics of the regions of Australia and those surrounding it: Asia, the Pacific and Antarctica. They explain, using examples, how the interaction of physical processes and human activities create variations within the regions. They use evidence and appropriate geographical language to explain contrasts within smaller regions surrounding Australia. Students describe differences in culture, living conditions and outlook, including attitudes to environmental issues, in these regions. They demonstrate understanding of environmental issues based on inquiry and propose ways of ensuring the sustainability of resources. Consider why you have that impression or image—is it because of the narration? Or the visual images? Or the sound effects in the video clip? Or some other reason? Attitudes and values are things that the society agrees with, or thinks are important. See if you can identify any attitudes and values in this video clip. For example, you might decide that an attitude or value in this video clip is that we need to conquer the environment. See if you can identify any others. One of the values of many people today is a belief in ecological sustainability. That means having as little impact as possible on an environment. Do you think the pioneer scientists of this video clip shared that value? Look at such aspects as the use of animals, attitudes to wildlife, use of technology to help you work out an answer. The video clip was originally made as a film in 1962 from 1912 footage. Do you think a contemporary video about the environment would focus on the same images, or might it reflect different attitudes and values? Explain your reasons. The filmmakers have created their video clip to pass on certain messages. What do you think these are? For example, is there a message in the film about human endeavour? Or about nature? Or about our relationship to the environment? 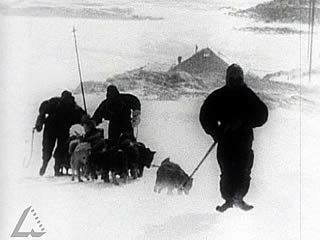 The pioneer scientists in this video clip lived in a small and isolated community in Antarctica. What sort of qualities would these people have needed? What rights and responsibilities might have been the most important ones for them? A key value underpinning Australian actions in Antarctica today is sustainability. Look at the way the pioneers in the video clip behave. Can you identify any actions or behaviour that would be considered unacceptable today? Discuss why such changes might have occurred over time. Identify an environmental issue facing Antarctica today. For example, it might be the impact of tourism. Prepare a briefing paper for a meeting to discuss the issue. The briefing paper will need to include background information, a summary of the issues, statements on possible solutions. There are many international treaties in force in Antarctica. Examine one of these and Australia’s role in implementing it. Research an Australian scientific base in Antarctica. Prepare a set of management criteria for the base that will promote ecological sustainability of the area.